We hear that many foreign travelers have difficulty finding automated teller machines (ATMs) that accept foreign-issued cards in Japan. It’s actually not that hard once you know that ATMs at the post offices and 7-Eleven convenience stores allow you to withdraw Japanese Yen by both debit and credit cards issued outside Japan. You can easily find a post office or 7-Eleven convenience store in cities and airports. Also, Japan Post Office has recently started to locate their ATMs in Family Mart convenience stores, mostly those in cities. Convenient enough, 7-Eleven stores and Family Mart are open 24hrs. ATMs from Citibank, Shinsei Bank, and some from AEON Bank also accept foreign-issued cards. If you’re visiting outside major urban areas, it might be a better idea to prepare some cash in advance. 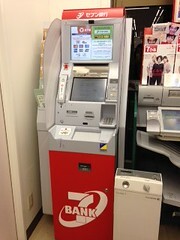 Although post offices or Japan Post Bank ATMs are located throughout Japan, they are not available 24hrs. Lastly, before coming to Japan, make sure your card can be used overseas. Some banks don’t allow the cards to be used abroad unless informed by the cardholder for security reasons. Please check the opening hours and further details on their respective websites. Maestro-branded EMV Cards issued outside of the Asia/Pacific Region are able to withdraw only at AEON Bank’s ATMs. Please check MasterCard website for detailed information.